In 1986 DC simplified their continuity by ridding themselves of alternate Earths. 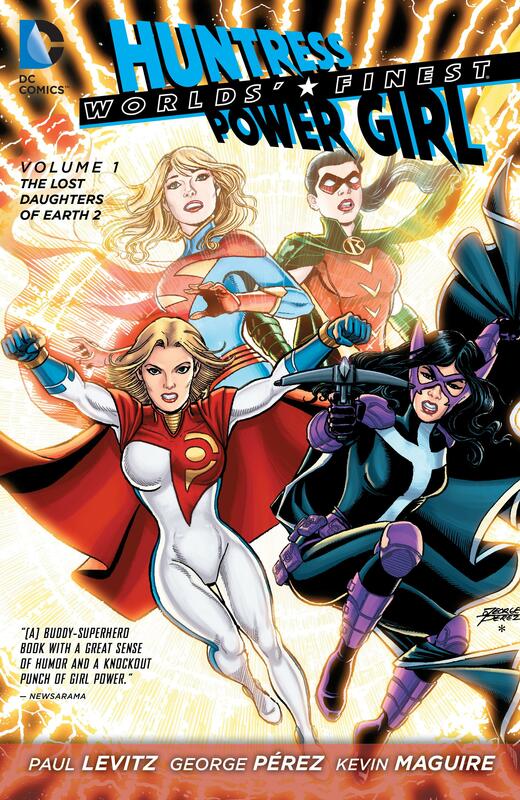 This caused complications for Huntress and Power Girl, until then designated as residents of Earth 2 with no counterparts on the primary DC Earth. In the 21st century DC decided multiple Earths wasn’t such a bad idea after all, so Huntress and Power Girl were revised, now fully aware an alternate Earth is their true home, and desperate to return there before Darkseid destroys it. The Lost Daughters of Earth 2 is one spectacular looking graphic novel. 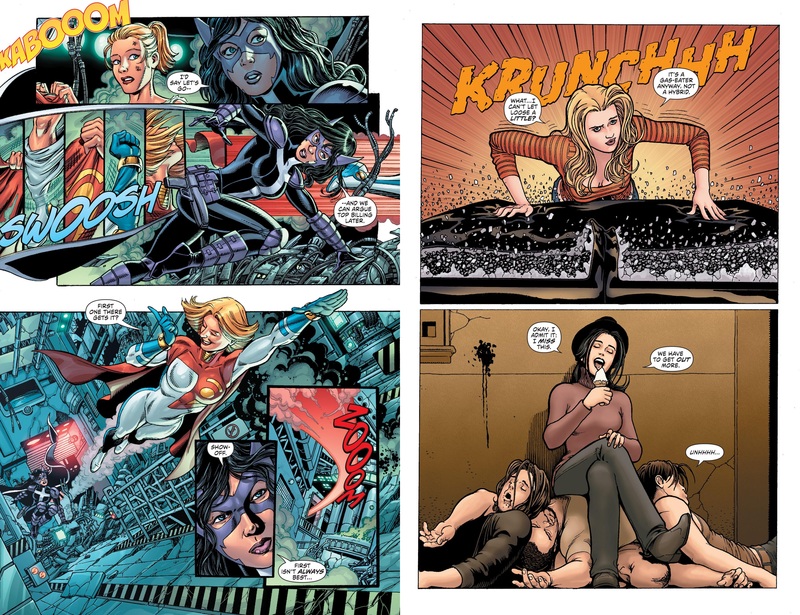 The imagination and detail of George Pérez supplies art for the present day sequences, revelling in shattered debris and energy crackles, while the simpler, but equally good Kevin Maguire handles scenes set in the past. It’s a gold standard combination as it gradually becomes apparent that there’s a greater purpose to the flashbacks than just informing the present. Paul Levitz has put a lot of thought into background detail bolstering the stories. 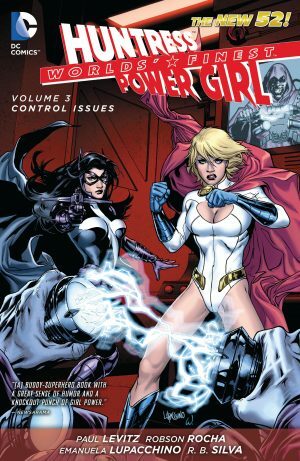 The ways two stranded people from another Earth raise money are well introduced, and the present day sequences occur five years after the characters arrived, both Huntress and Power Girl having established themselves in different ways, but without maintaining a close relationship. 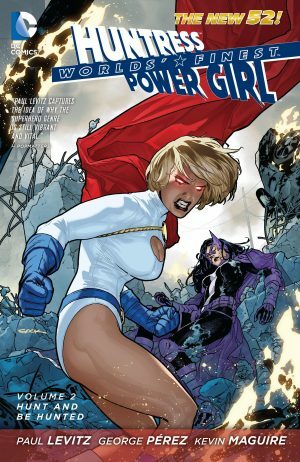 It’s a retrograde step to reorganise continuity so Karen Starr/Power Girl no longer develops the technology that powers her company fortune, but she still runs that company. Likewise, the Huntress as uncertain and even somewhat shy contradicts the more familiar personality, but then Levitz created the Huntress in the 1970s, so perhaps the modifications were always his intention, and he bolsters the reasons in the final chapter. Midway through we have two brief solo adventures, well drawn by Jerry Ordway and Wes Craig, exploring what primarily motivates both women, and Craig with Maguire draws their first meeting when still Robin and Supergirl of another Earth. The Lost Daughters of Earth 2 takes a languid approach to events. It’s an exploration of friendship in adversity, and a form of quest (to return home), but pretty well everything that informs the plot is introduced in the opening chapter, after which there’s little progress. 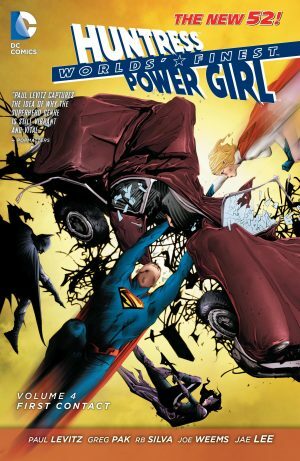 Levitz introduces further complications, such as Huntress and Power Girl’s powers working a little differently, and seeming ties to Apokalips and Darkseid, but this is mostly predictable superheroics very well drawn. Thankfully Hunt and be Hunted picks up the pace. One more thing. Before committing to five volumes of this series (the sixth continues the numbering, but isn’t connected) you should know they don’t conclude all plots set in motion here. For a resolution you’ll have to follow the characters into Earth 2: World’s End.